Drug-food interactions: myth or reality? The issue of interactions between drugs and foods should never be ignored, as it is important. Here is some information on the subject. Drug interactions are reactions that sometimes occur when two or more medications are taken at the same time or when food is ingested with medication. It is true that some foods can modify the way in which some medications are absorbed or eliminated by the body. Sometimes, they slow, diminish or increase their effects. Therefore, the risk of a treatment's inefficacy or adverse effects is very real. On an empty stomach or with food? Taking medication on an empty stomach or with food can, in some cases, affect the medication's degree of absorption by the body. When medication is taken orally, it must ultimately reach the blood flow in order to have an effect. To achieve this, it must be absorbed through the walls of the digestive tract. Therefore, the presence of food can compromise absorption of the medication, promote it or have no incidence at all. Furthermore, the irritating effects that certain medications can have on the digestive tract must also be considered. Symptoms or health issues can manifest themselves, including stomach ache, acid reflux, nausea or vomiting. Therefore, it is sometimes preferable to take these medications during meals to lower the risk of adverse effects to the digestive tract. Many medications can be taken either with or without food. However, some drug manufacturers formulate very specific instructions regarding food. For instance, while some medications must be taken "during a meal", for others, you will be advised that drug action may be slower "if it was taken with a high fat meal." In sum, there is no universal rule and it is always best to speak about it to your pharmacist. Alcohol consumption while taking medication can present some risks of interactions, but this isn't always the case. The best way to avoid all risk is to refrain from drinking alcohol, but this can be difficult if you take medication daily. It is better to be well-informed in order to make good choices and avoid "bad mixes." For additional information about drugs and alcohol, read the following text. 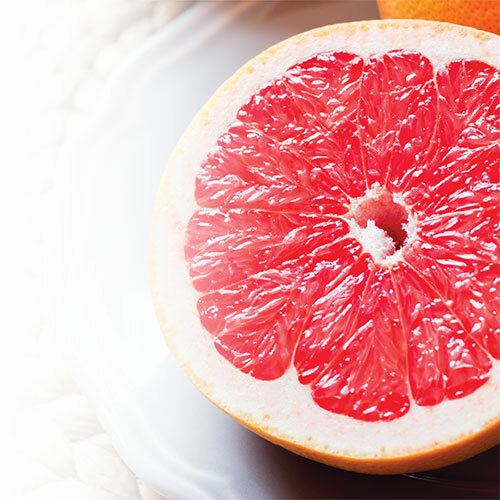 Grapefruit juice interacts with some medications (e.g., statins, antihypertensives, antianginals, immunosuppressors). It promotes their absorption by the body. It causes greater exposure to these drugs and can increase their therapeutic or adverse effects. However, it would be a mistake to conclude that grapefruit (or its juice) should never be taken with medication. As with all citrus fruit, grapefruit has many virtues when it comes to health. Speak to your pharmacist to find out if you can eat it freely given the medication you take. Another typical medication-food interaction is with milk products. The absorption of some medications, including antibiotics, can be lowered when it is taken concomitantly with calcium. Calcium is found in milk products and can be taken as a supplement. That is why pharmacists often recommend waiting at least two hours after taking medication that can cause an interaction before having milk products or taking a calcium supplement. If there is a risk of interaction between medications you are taking and milk products (or calcium), ask your pharmacist to recommend what you should do. Medications can interact with other foods or nutrients not mentioned until now. This is the case, for instance, with warfarin (CoumadinMC), which interacts with vitamin K-rich foods (cabbage, broccoli, lettuce, spinach, etc.). Vitamin K lowers the anticoagulant action of warfarin, which can increase the risk of thrombosis (blood clot). What matters is not necessarily to avoid vitamin K-rich foods, but rather to eat them consistently. Coffee, tea, and soft drinks are examples of beverages that can also affect the absorption and effects of certain medications. Ask your pharmacist to inform you of the risk of interactions between the drugs you take and food or alcohol. If a risk exists, ask him/her what you should do to prevent it. Remember that some nutrients found in supplements, such as calcium, iron, and various vitamins can interact with the medications you take. Make it a habit to take your medication with water instead of with other fluids. Always have an up-to-date list of your medications on hand, including over-the-counter medications, natural health products and supplements. The risk of interactions between drugs and food are very real. As a medication expert, pharmacists know about the risks and the measures to be taken to avoid them. Be sure to speak with them in order to obtain factual information. Now, that’s definitely an interaction that will be beneficial to you!